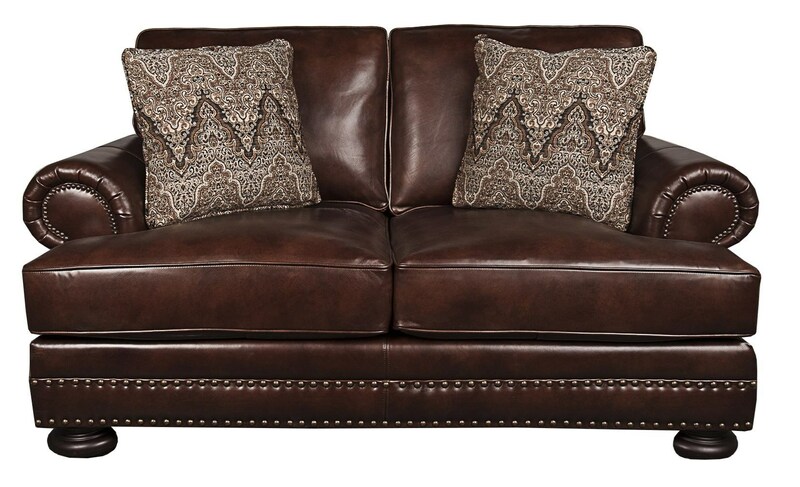 The Foster Classic 100% Leather Loveseat with Nail head Trim and Down Filled Pillows by Bernhardt at Morris Home in the Dayton, Cincinnati, Columbus, Ohio, Northern Kentucky area. Product availability may vary. Contact us for the most current availability on this product. Fabric Options Items in this collection are available in a number of upholstery options through special order methods. Visit one of our retail locations or contact us for specific information. 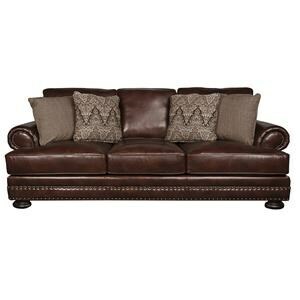 Arm A beautiful, traditional rolled arms with pleat details and nailhead trim. Leg or Skirt Over-sized, exposed wood, turned bun feet add balance and style to this group. This collection is a group of living room seating featuring stylish mid-priced home furnishings, in fabric and leather upholstery options. 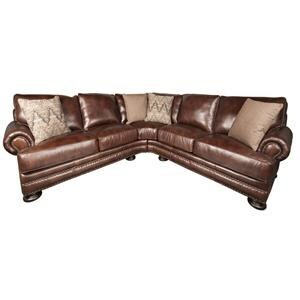 It has features like plush rolled arms, nailhead trim, exposed wood turned bun feet and comfortable, plush cushions. You will love the elegant style this living room furniture offers you and with the ability to choose the upholstery, you can customize it to fit in your home perfectly. 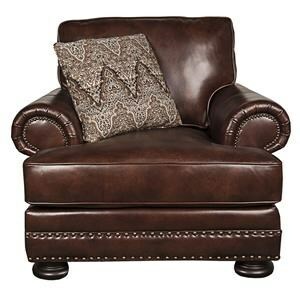 The Foster Collection includes a stationary sofa, a sectional, a chair 1/2, a gorgeous chair and ottoman and a love seat. Plenty of choices to help make your home design everything you dream about! 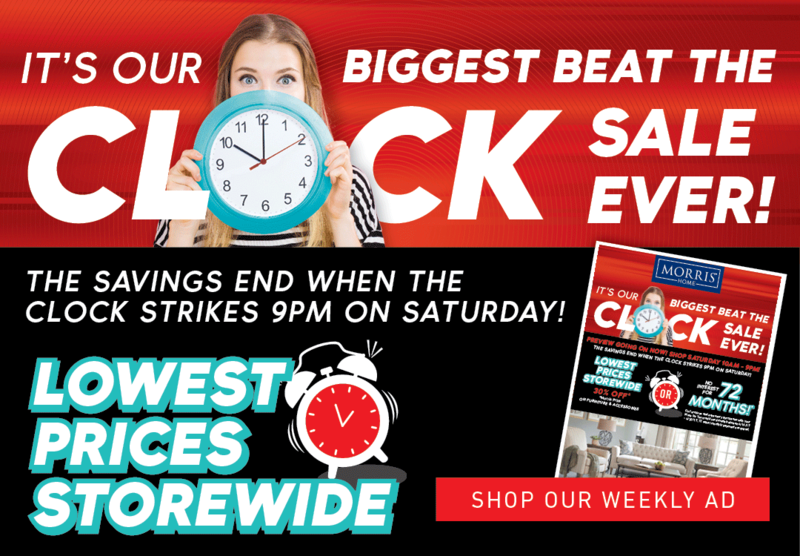 The Foster collection is a great option if you are looking for Transitional Casual furniture in the Dayton, Cincinnati, Columbus, Ohio, Northern Kentucky area. 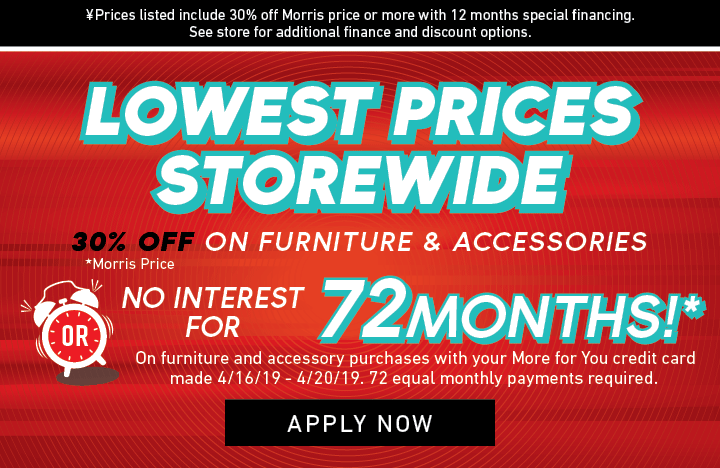 Browse other items in the Foster collection from Morris Home in the Dayton, Cincinnati, Columbus, Ohio, Northern Kentucky area.